The Kia Tigers are doing a lot of things right. At 65-35-1, they are in first place in the Korean Baseball Organization, with a comfortable five-and-a-half game lead over second-place NC Dinos. As a team, they are cumulatively hitting .305/.375/.480, and are first or second among teams in the KBO in virtually every offensive category. But the emphasis on offensive firepower has not come at the expense of pitching. While Kia’s hurlers are not dominating the league the way their hitters are, their pitching staff ranks first in the KBO in wins above replacement, a statistic that computes player value, with 16.1, and has above average marks in earned run average and fielding independent pitching. However, Kia has had one major flaw throughout the season: They play significantly worse on weekends. This peculiar affliction affects both sides of the ball -- both Kia’s pitchers and batters perform worse on weekends. But the effect is most noticeable on the hitting side, with a precipitous drop in performance in games in the second series of the week, from Friday to Sunday, as opposed to the first series of the week, from Tuesday to Thursday. 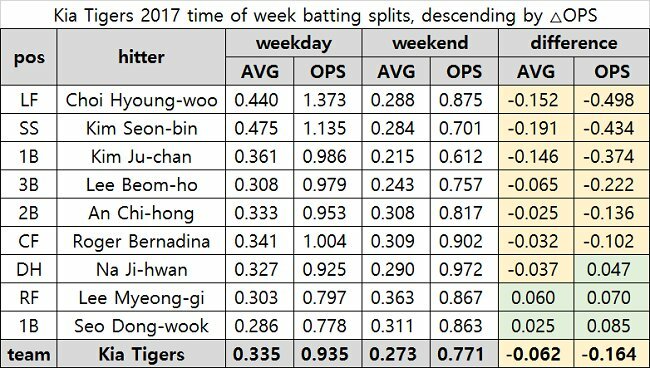 The table below shows the batting splits for the top 10 Kia hitters by plate appearances, as well as the team, and clearly shows the distinction between weekday and weekend games. From Tuesday to Thursday, the Tigers hits like, well, the Tigers. But from Friday to Sunday, Kia’s cumulative batting line is comparable to that of the Lotte Giants or Samsung Lions, who are in seventh and eighth place, respectively. This stark difference in team performance has borne out in the team’s record. On Tuesday to Thursday games, Kia is 41-9, an .820 winning percentage, which would put it on pace to win 118 games over a full season. For comparison, the KBO single season wins record is 93, by the 2016 Doosan Bears, and the 90-win mark has only been surpassed one other time, when the now defunct Hyundai Unicorns won 91 in 2000. However, on Friday to Sunday games, Kia is 24-26-1, a .471 winning percentage, or a 68-win pace. If Kia had a .471 winning percentage this season, they would slot in at eighth in the 10-team league between, guess who, Lotte and Samsung. There are no obvious reasons for this drop-off. Kia’s schedule has been fairly balanced between weekday and weekend series, as they have faced good and bad teams alike. Other teams have some variation between weekday and weekend, but there is no trend toward weaker weekends, and especially none as severe as displayed by Kia. However, as Kia is still well in control of the 2017 KBO standings, and performing well overall, this weekend drop-off stands as more of a curiosity than an actual problem. Perhaps it actually makes the team even scarier; despite running roughshod over the rest of the league, the Kia Tigers still have room to improve.